Scott Schraml’s bright yellow Mojo Bowl trailer is a foodie destination at Grand Canyon University, though he’ll soon move into a more permanent campus home. The food truck-style kitchen, which Schraml tows behind his Toyota SUV, serves handmade açai berry bowls and smoothies – making Mojo Bowl one of the cleanest, healthiest food options at GCU. Mojo Bowl menu items are simple: fresh fruit, nutrient-rich greens, protein-loaded nuts, granola and other lighter ingredients blended as refreshing “fuel food” to cool a body to its core. Many menu items are vegan, gluten-free, dairy-free and soy-free. Based on feedback from students, GCU executives and campus food services-provider Sodexo agreed to bring Mojo Bowl and Qdoba Mexican Grill to new locations on the west side of the Student Union as part of a project that will create a central, walkable food court with additional outdoor seating between the Union and Thunder Alley. The new site will be Schraml’s first retail location. 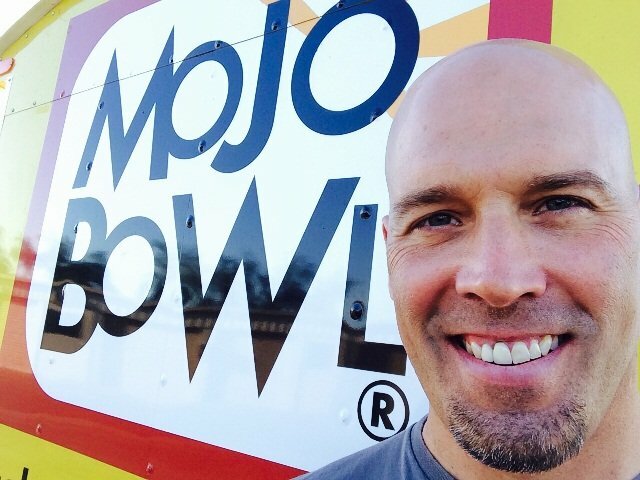 “Students tell us that there’s nothing else like us on campus,” said Schraml, a triathlete and former salesman who left the corporate world to launch Mojo Bowl several years ago. “Once they try us, they crave us,” he said. Menu items will include açai bowls, smoothies, made-to-order yogurt parfaits and “overnight oats” – oats served in Mason jars, blended with ingredients like almond milk and fruit. Mojo Bowl also serves healthy salads, but Schraml said those make up such a small portion of his business that he will focus on other items for GCU. The Student Union location will have four blenders, an upgrade from the two Schraml runs in his mobile trailer at events such as GCU farmers’ markets and Food Truck Friday in downtown Phoenix. The 48-year-old Wisconsin native sees the GCU opportunity as the first step in expanding his brand into brick-and-mortar locations, which is in line with the business plan he put together several years ago. Schraml said Mojo Bowl is an extension of who he is. He practically spends entire days focused on serving guests and promoting the healthy benefits of his food. Mojo Bowl plans to be on campus throughout the summer most Thursdays from 10 a.m. to 1 p.m. Schraml updates patrons via @theMOJOBOWL on Twitter about locations and menu shifts. Associated Students of GCU president Cody Dumas said last year’s student government staff was instrumental in petitioning University leaders to bring Mojo Bowl to campus. The Mojo Bowl and Qdoba locations are expected to enhance the student experience on the west side of the Student Union. Qdoba, for example, will provide the only Mexican fare – burritos, tacos, quesadillas and nachos – on campus in an 1,865-square-foot space where the old Mail Center was. It will be the Colorado-based “fresh Mex” vendor’s seventh Valley location, according to its corporate website. Prem Lawrence, general manager for Sodexo on campus, said the additions of Mojo Bowl and Qdoba addressed student feedback from a survey earlier this year that revealed a resounding interest in healthier alternatives and a Mexican food location on campus. The feedback also suggested lines were too long at the Subway at Thunder Alley. As a result, Lawrence said, Subway will add a second sandwich line to alleviate congestion by this fall. GCU and Sodexo also are considering adding a “gourmet pizza by-the-slice” location and something like an additional healthy “in-house brand” to provide more lunch options. Lawrence said the additions of Chick-fil-A and Subway last year proved successful, but that the next phase of food vendors would help centralize dining options to the Student Union-Thunder Alley area. Contact Michael Ferraresi at 602.639-7030 or michael.ferraresi@gcu.edu. It would be nice if these wonderful eatery options were explored for the side of campus by CON and COE.